There is mounting speculation that a Facebook app for the iPad is imminent. Despite Mark Zuckerberg's assertion that the "iPad isn't mobile," the demand for a Facebook app and the success of alternative Facebook apps for the iPad suggest otherwise. 1. Zuckerberg is wrong. The iPad is mobile. Yes, the Safari browser on the iPad is more capable than its iPhone equivalent, but the iPad--and every other tablet--is a mobile device. I don't have any complaints about navigating and working with the Facebook site on my PC, but the iPad is another story. 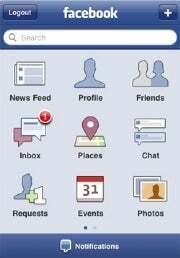 The Facebook app on the iPhone is arguably one of the best apps available for the smartphone, and it makes working with Facebook on the go simple and intuitive. 2. Display. Granted, I can pinch and zoom, and resize Facebook to fit the iPad display in the Safari browser, but the Facebook iPhone app just fits the screen, and I would expect the same from a Facebook iPad app. The display is a fixed size, and Facebook should be able to deliver the content to fit on the iPad display without me sliding back and forth or pinching and zooming. If the rumors are true, we may soon see a Facebook app like this on the iPad. 3. Photos. Facebook is one of the leading platforms for sharing photos online. This wasn't as big an issue with the original iPad because it lacked a camera, but now that you can snap pictures with your iPad, it would be nice to be able to easily post them to Facebook. The "Upload a Photo" option on the Facebook site expects to find a traditional file and folder structure to pull from, and doesn't work with the way photos are stored on the iPad. There is an option to upload via email, but choosing a photo from the library is a much more elegant method. 4. Checking In. Again, the iPad is mobile. That means, I take it with me when I go places. When I grab some lunch at a neighborhood restaurant, I'd like to be able to check in on Facebook Places. If there is a Facebook Deal available, I'd like to be able to take advantage of it. As the customer, I want Facebook to recognize the iPad is mobile so I can check in, and if I were the retailer, I would want Facebook to recognize the iPad is mobile so I am not ignoring potential customers with my Facebook Deals. As a fan of the Facebook iPhone app and owner of an iPad, I am very hopeful that the current rumors are true. I have used a couple of the alternative Facebook apps on the iPad, and they are OK, but they don't really compare to the experience I have come to expect from the Facebook iPhone app.